1. Phyllis didn’t write it. It was written for her with a line for her to sign. Phyllis did not own a computer; she had a manual typewriter all of her life. You can see samples of what her own writing looks like in the letters I previously posted, and in issues of In The Continuum. 2. Other contemporaneous letters from her (written by her, on her typewriter) indicate that she probably signed this under duress, or at least false pretenses. She was being told by someone she trusted that she was about to be sued by O.T.O. for using the name A⸫ A⸫, which was not true. That’s why it was written as a “statement,” “for the files,” “in case it is needed,” and not published at the time, and would not be published until after her death. 3. It is clearly a revision of history. Even if she did believe these things at the end of her life, it doesn’t change what actually happened, as she herself documented at multiple times earlier in her life. 4. It still relies on the two passages from the letters by Karl Germer, which, in context, do not substantiate the claim made about her degree. In other words, it provides no new information. 5. And even now, in this letter, she doesn’t actually say “I am a 5°=6▫.” In fact, she never said this her entire life. I think she just couldn’t bring herself to lie about something so important. 6. 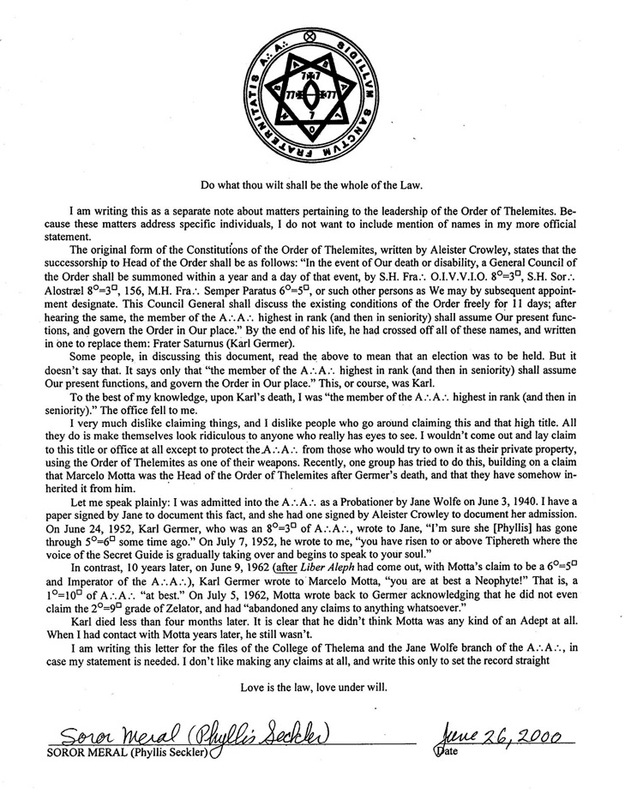 The Order of Thelemites is not the A⸫ A⸫. In particular, succession in A⸫ A⸫ does not pass to the most senior member. (And even if it did, Phyllis was not the most senior member.) Karl Germer designated Marcelo Motta as his successor, whom Phyllis acknowledged at the time, and years later as well. So, if anything, this letter pretty clearly demonstrates how at least one of the competing “Jane Wolfe” claimant groups was using Phyllis Seckler to bolster their attempts to claim exclusive control over A⸫ A⸫. Although those attempts failed, evidently there are still many people who have been (and continue to be) fooled by these deceptions.